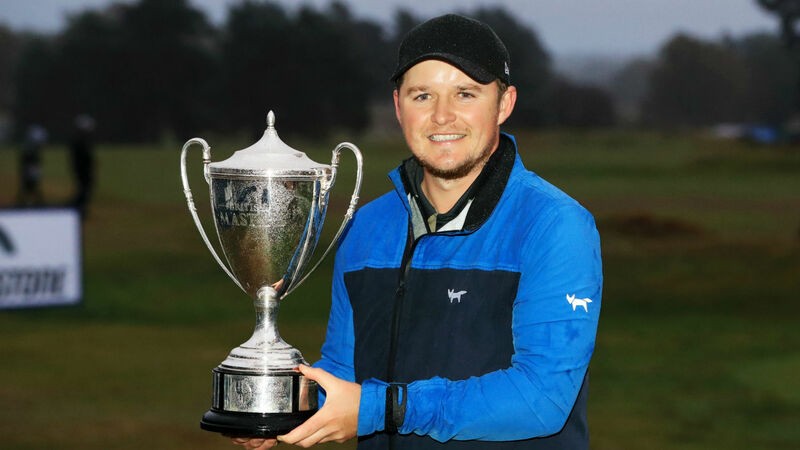 Eddie Pepperell held off the challenge of Alexander Bjork to complete a wire-to-wire win at the British Masters in wet and windy conditions on Sunday. Pepperell added a stunning eagle to his hole-in-one from Thursday as he claimed his second European Tour title of the season, finishing the tournament on nine under and with a two-shot lead over Bjork after closing with an even-par 72. Bjork had a chance to force a play-off when he took to the 18th tee needing to pick up one stroke, but he was unable to salvage a wayward drive and registered a bogey that forced him to settle for second. Pepperell's advantage slipped from three strokes at the start of the day to one by the time he made the turn in 36. However, a magnificent eagle from the rough on the par-four 10th restored his lead in emphatic fashion. Dropped shots on 15 and 16 for the Englishman opened the door for Bjork, who was three under for the day through 11 holes, only for the Swede to miss his opportunity with bogeys on 13 and 18. "I said [on Saturday] I wouldn't know how it felt being in the lead at this event as opposed to another one but now that I've won it, it does feel special," Pepperell said when presented with the trophy. "The crowds are great, I've had some great local support around a beautiful golf course - one I've played a lot as a junior and an amateur - so to come and win this event is really special. "It was such a tough day with the conditions. I didn't swing it very well from the get-go and it was really hard then to find it. It was an absolute grind for four or five hours. It just shows how important it is to build a lead when things are going well for you. "I'm delighted to go wire-to-wire, especially at this event, I'm over the moon." Lucas Herbert carded a three-under 69 to earn a share of third with Jordan Smith, while Justin Rose produced his best round of the tournament – a 70 – and placed eighth. Tournament host Rose's Ryder Cup team-mate Tommy Fleetwood was a shot further back in a seven-way tie for ninth.